Sudanese demonstrators chant slogans as they participate in anti-government protests in Khartoum, Sudan, Jan. 17, 2019. Rudwan Dawod, a political activist with the group Sudan of the Future Campaign, vanished hours before the protests were slated to begin Thursday, his wife said. Rudwan Dawod, a political activist with the group Sudan of the Future Campaign, vanished hours before large protests were slated to begin Thursday, Nancy Dawod said. Nancy Dawod, who lives in Eugene, Ore., said she learned of her husband's arrest through a Sudanese lawyer who told her that he and Rudwan Dawod had been arrested together, but Sudanese authorities released the lawyer because he had no prior arrests. Nancy Dawod said the U.S. Embassy in Khartoum was trying to call Sudanese authorities to confirm her husband's whereabouts and that officials would go to the headquarters of the National Intelligence and Security Services on Saturday morning to request access to all American citizens being detained in Sudan. Nancy Dawod said the lawyer, who prefers not to be identified for safety reasons, claimed he had been beaten around his head. She said she feared for her husband's safety. Sudanese demonstrators burn a tire as they participate in anti-government protests in Khartoum, Sudan, Jan. 17, 2019. "I'm pretty worried about him. Because of his love for the people there, he just continues the struggle and is usually out in front," she said, adding she was "hoping and praying" security forces would not harm her husband. "Because he is such a well-known public figure, I'm hoping he will be treated better." Nancy Dawod said she also hoped pressure from the United States would help ensure his safety. Rudwan Dawod was arrested shortly before Christmas in Sudan, then released. He was arrested on another occasion last year and detained for close to six weeks, Nancy Dawod said. He was never charged with a crime during either arrest, she added. Rudwan Dawod returned to Sudan about two years ago. Nancy Dawod said she, her husband and their 6-year-old daughter, Sudan, are U.S. citizens. Dawod said she spoke to her husband a few hours before his arrest but that he was being "very cautious," knowing that his arrest was "something that we knew could happen." Nancy Dawod said her husband was a candidate for first vice president of Sudan until his Sudan of the Future Campaign withdrew from elections scheduled for 2020. She said they stood with other opposition political parties "to end [Sudanese President Omar al-]Bashir's brutal regime and enter into a transitional government" until a democratic election is held. Nancy Dawod called on the U.S. officials "to pivot their policy on Sudan and to support freedom and justice there," adding there is "no betting with this bloody regime. It needs to end." For nearly four weeks, protesters have been demanding the resignation of Bashir, who has said that will not happen. The U.S. decided to remove economic sanctions on Sudan last October. Sudan's economy has been in crisis for several months, with inflation soaring and people struggling to survive. 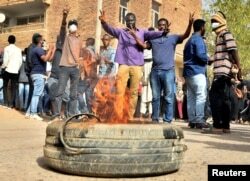 The protests began over rising prices for bread and fuel and morphed into a demand for Bashir to give up his 30-year autocratic rule over Sudan. Bashir has withstood large-scale protests before. Nadia Taha contributed to this report.